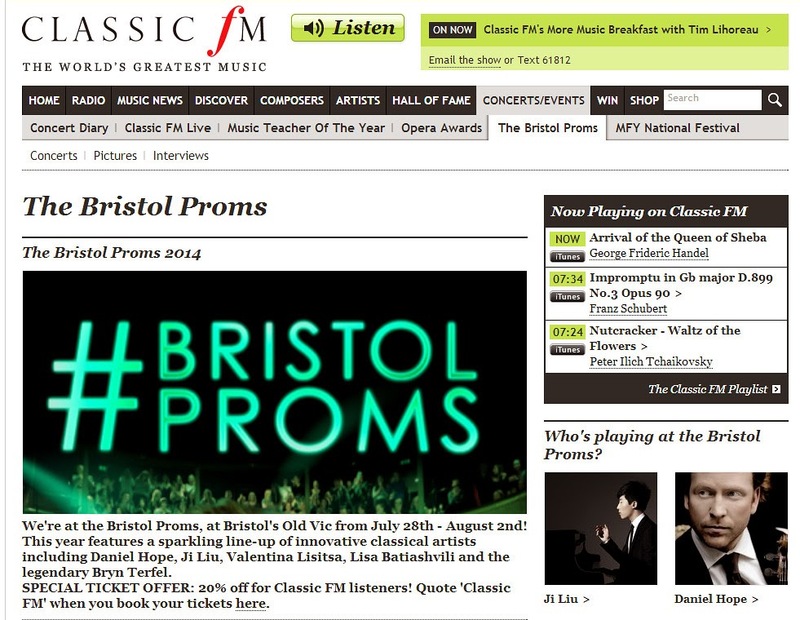 The alliance between Universal Music and Classic FM to present and promote the high profile Bristol Proms, a concert series that draws heavily on artists signed to Universal Music and Classic FM record labels, demands closer examination. All too often BBC Radio 3 is seen as the only 800 pound gorilla in classical radio. But Classic FM tips the scales at an even heavier weight: with 5.3 million listeners the station controls 74% of the UK classical radio market, leaving Radio 3 with just 26%. The success of Classic FM since its 1992 launch in exploiting the 'shallow classical' market has been the biggest single factor in reshaping classical music not only in the UK, but also globally. BBC Radio 3 has reacted by chasing the same audience as Classic FM, and this has led to the much lamented dumbing down of Radio 3's output. a process that has spread virally around the globe. Radio 3's reactive strategy is proved by hard facts figures to be a mistake. The latest RAJAR audience data released today for Q2 2014 (July 31) shows Radio 3's audience at its lowest figure for four years; with listeners down 5.6% on the same quarter in the previous year, hours per listener down 6.6%, and total listener hours - the acid test of the success of a radio station - down a jaw dropping 11.0%. For the first time the Radio 3 audience is smaller than that of the cutting edge music station BBC Radio 6 which only broadcasts on digital frequencies. (I wonder if the board of Aldeburgh Music understands the RAJAR data?). The strategic error made by the BBC was not to appreciate that the 'shallow classical' market exploited by Classic FM is of finite size, and once filled does not show further significant growth. As a result BBC Radio 3 and Classic FM have ended up fighting increasingly desperately for the same finite 'shallow classical' market, with Radio 3 abandoning its core 'deep classical' audience in the process. The data released today yet again shows this to be a zero sum game, with the total audience for classical radio in the UK declining 3.8% year on year; it is almost certain that those 283,000 lost listeners have switched to alternative distribution platforms - Spotify, Naxos Web Radio etc - for their regular fix of 'deep classical'. An ability to lift the Radio 3 audience figures out of the doldrums by acknowledging the error of their 'shallow classical' strategy, combined with widespread and justified criticism of the station for modelling itself on Classic FM, has prompted the BBC to differentiate Radio 3 from its commercial competitor by stressing that much of its output is live music; which is why the word 'live' appears so many times in every Radio 3 presentation announcement. The BBC's emphasis on live music is a smart but misguided strategy based on its monopoly of live music resources in the UK and a guaranteed funding stream that is beyond the wildest dreams of its commercial rival. 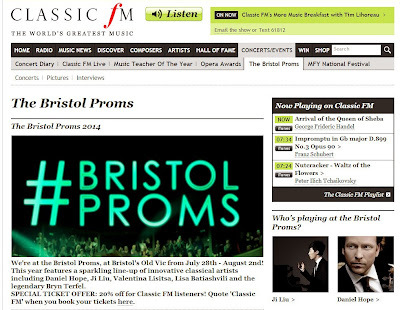 There can be no doubt that Classic FM's decision to partner with Universal Music - UK recorded classical music market share 56% - in the promotion of a major live concert series is, in turn, a reaction to Radio 3's live music positioning; if there is any doubt that this is another reactive strategy just compare the two screen grabs accompanying this post. 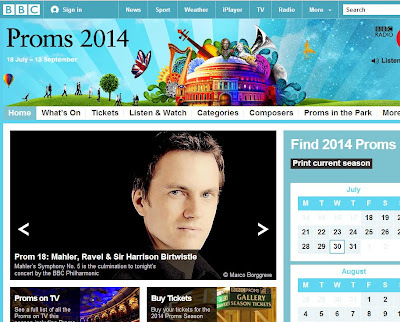 There are, undoubtedly, fine musicians appearing at the Bristol Proms, and there is much to admire in the concert series. But the emerging agenda should concern everyone in classical music. Let's be quite clear, music is not at the centre of the agenda for either Universal Music or Classic FM. At the centre of the agenda of both organisations is grabbing market share irrespective of the long term impact on classical music. The future of classical music is increasingly being determined by commercially motivated alliances between monopolistic media corporations, and Universal Music and Classic FM are certainly not the only culprits. Attention has already been drawn here to the close links between the BBC and artist management agencies, and almost every BBC Radio 3 lunchtime concert uses members of the BBC new generation artist scheme, an opaque arrangement that mixes broadcast and concert opportunities, artist development, and commercial recording contracts - nine co-produced CDs in the now defunct EMI Debut series. The Bristol Proms may be revolutionary. But they are also a new major concert series that is controlled by a predatory alliance between a major broadcaster - Classic FM - and a mega corporation - Universal Music via its subsidiary U-Live - and this alliance has controlling interests that range from music publishing through concert promotion to recorded and broadcast media. The Telegraph recently gave the artistic director of the Bristol Proms Tom Morris a platform to make the the admirable plea that "Classical music audiences should be free to behave how they wish." I will go further and say that classical music audiences should also be free to listen to what they want, and not be told what they can hear by the self-interested and, all too often, erroneous strategies of media corporations. When Radio 3 offered a wide and eclectic choice of music - as BBC Radio 6 now does - it thrived. Today it is no more than a sad reminder of what happens when you tell audiences what they should be listening to.